In my humble opinion, SA is more successful not because it's a religion, but an "ecclesiastical house" for disputes of egos and power. Basically, politics with some theological terms. Agreed. The whole was still properly executed to allow it to flourish, had another religion been founded by someone else in Morek, it would not have been guaranteed to end up with the same success. But it still had an immeasurable advantage over any other religion the game ever saw. A great battle took place today. And my character is tanking many damages. 8008 hits, I never hear this number before. White Tree Guardians (47) take 8008 hits from archer fire, which cause 124 casualties, wiping the unit out. Now, after the holidays and drink myself, I can bring my new char to the next campaign. A new Serpentis arise!!! Here's something to wet the appetites of those who weren't present. The wind really favoured the North's advantage in infantry, but the archers carried the day still. Can someone sum up the current status on THE WAR? Who's fighting who now and why? Who's 'winning'? Which nation is currently strongest? Thanks! Vix, Fallangard, and Perdan vs Highmarch, Caligus, Eponnlyn, Shadowdale, Sirion, Redhaven, and Nivemus. Perleone seems to be losing. I'll let you guess which side is winning on the other war. Sirion, Nivemus, Shadowdale, Eponllyn, Caligus and Redhaven are the northern side, now plus Highmarch which recently flipped to join the north. Perdan, Vix Tiramora, Fallangard and Obsidian Islands are the southern side. But Obsidian Islands isn't doing much (as usual ). 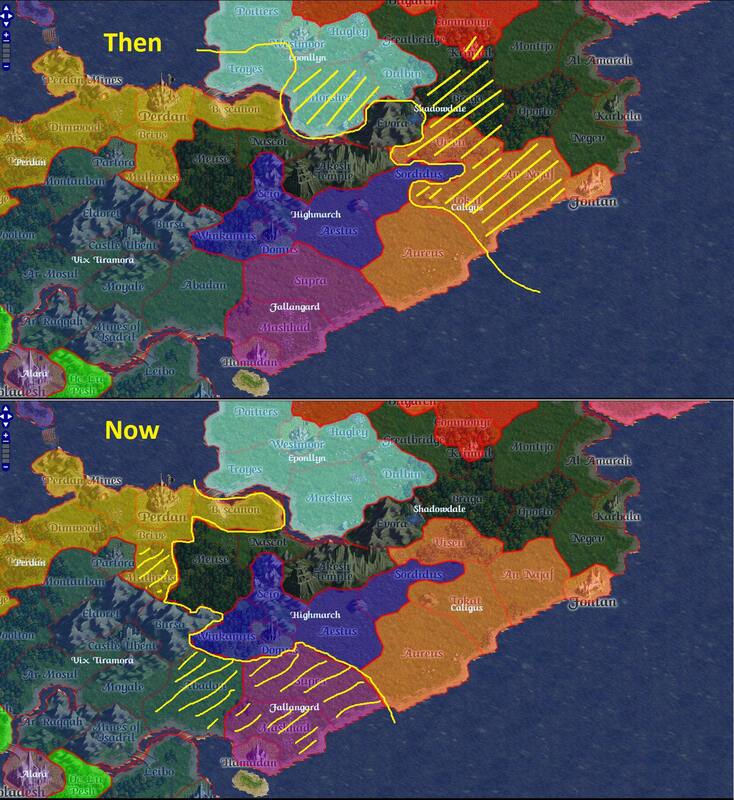 It's mainly Perdan and Vix Tiramora doing the fighting for the south, although Fallangard is doing okay at participating considering its size. From my perspective, I'd say the north is winning, but its very slow progress. Some people might say the war is bogged down in the Highmarch/Perdan section of the map, but I'd say the north is gradually chipping away at the southern lands. It's hard to say which nation is the strongest. I think Sirion is fieldling the most CS at the moment, but Perdan and Vix Tiramora are both pretty strong too. Nivemus would also be in the mix when they're at full strength. The far south of the map has its own war going on. Perleone against Alara and Minas Nova. I can't say who's winning. Just looking at the map, you'd think Perleone was doing badly. But I don't think the map tells the full story. Alara appears to have lost several regions in past few days. Perleone is also probably the potentially strongest of the three far southerners. Well Highmarch only recently flipped, and Perleone only recently declared war on Minas Nova. Some months back, Highmarch, Perleone, Alara, and Minas Nova were with Vix, Fallangard, and Perdan against the rest of the North. Obsidian Islands is as irrelevant as ever. Technically aligned with the South, they spend their days pathetically taking, and then systematically losing, the worst region in the game. Ehrendill will arrive in Perleone soon - with dreams to stop or help them win the war so an unified south can give the north a good fight before Perdan disappear. North vs South!!!! er... I said SOUTH vs the North! Vix and Perdan started double-crossing Highmarch, so Highmarch decided to flip to get revenge. Meanwhile the far south boiled over into long overdue open conflict. Looks like Caligus will finally be able to kill Edvard and reclaim their city. How long has it been? 5 years? The irony is that Edvard's the one insisting on being in this position. Highmarch always fought to have the North let Fallangard be, but... we grew tired of them constantly helping Vix out against us, and them looting Winkamus was the last straw.